Hekinan Yakisoba (White Yakisoba) comes from Hekinan City, in Aichi Prefecture - the birthplace of white soy sauce. Unlike the average, black Yakisoba sauce, the coloring of this finished product comes directly from the ingredient's pale hue. To enjoy, after stir-frying veggies and noodles, mix in about one ounce of sauce per serving. 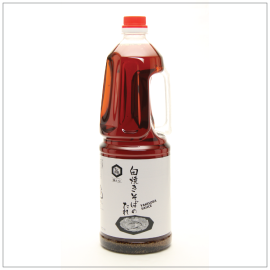 Organic White Soy Sauce (Organic Wheat, Salt, Organic Soy Bean), Processed White Soy sauce (Seasoning <Bonito, Horse Mackerel, Tuna, Japanese Shiitake Mushroom>, Organic White Soy Sauce<Organic Wheat, Salt, Organic Soy Bean>, Salt, Millet Jelly, Protein Hydrolysate, <Corn>, Sugar, Bonito Extract, Distilled Spirits <Sugar Cane>, Sweet Rice Wine <Sweet Rice, Koji Rice, Brewed Alcohol <Sugar Cane>, Distilled Alcohol <Rice>,Saccharide <Potato> Kelp Extract, Yeast Extract), Sweet Rice Wine (Sweet Rice, Koji Rice, Brewed Alcohol, <Sugar Cane>,Distilled Alcohol <Rice.>, Saccharide, <Potato>), Sugar, Black Pepper, Garlic, Yeast Extract, Alcohol (Sugar Cane).